Last weekend two severe tropical cyclones visited Australia, one hit WA and the other one the NT. Yet despite it being only late March, the Gibb River Road is open and the Kalumburu Road should open Wednesday. 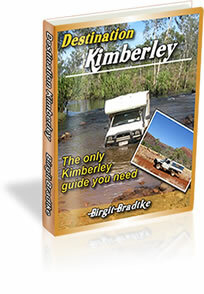 Your guide Destination Kimberley is still the most comprehensive and best advice for independent travellers to the Kimberley and I hope it continues! We can pick up where the late wet season outlook from the last newsletter issue left off. It said that some weather models predicted a chance of monsoonal rains and possibly cyclones from mid March. The monsoonal trough moved south and reached Australia, and it had tropical lows embedded within it. 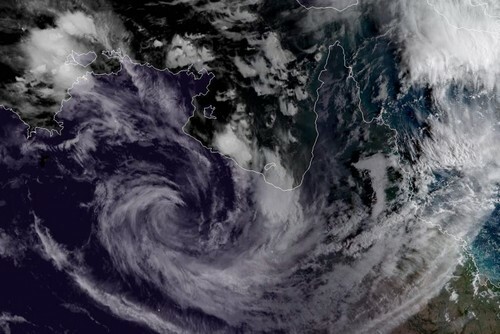 Given the warm temperatures over Australia and in the surrounding oceans, it is not surprising that those lows developed into cyclones, two of them at the same time. 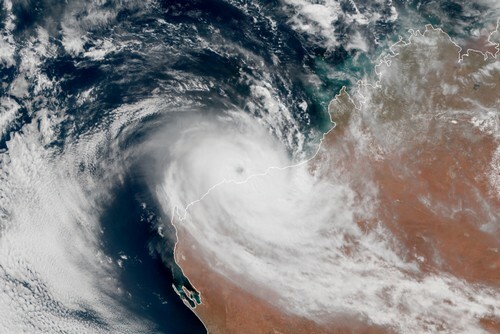 Tropical Cyclone Trevor initially impacted the Cape York peninsula in Quueensland as a category 3 storm. It then moved over the Gulf of Carpentaria, intensified to a category 4 and eventually made landfall on the NT on Saturday morning. Trevor was a very powerful storm, on par with the devastating cyclone Tracy that flattened Darwin in 1974. At its peak, wind speeds in the centre reached 250 km/h. Luckily Trevor crossed the coast east of Borroloola and Port McArthur, so those towns were spared the most destructive winds. Cyclone Trevor on Saturday, 11 am. About 2500 people were evacuated, and while there was of course a lot of damage, there have been no known deaths, major injuries, or major damage to infrastructure, and the Roper Highway soon reopened. Moving over land causes a cyclone to quickly weaken. Trevor was downgraded to a tropical low early on Sunday morning. Trevor, now a tropical low, around midnight. But because it was such a large storm and because the country in the area is so flat, Trevor could move far inland. 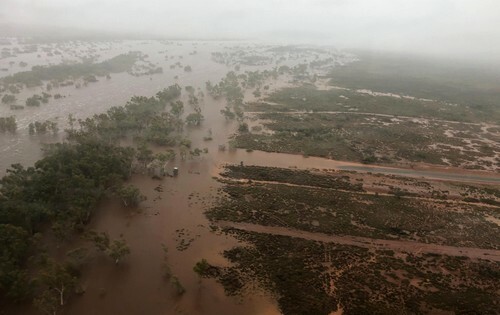 The storm crossed the Carpentaria district, still dumping over 100mm of rain in parts of the Barkly and Simpson districts on Monday, before returning to Queensland. Alice Springs and the Todd River catchment area saw no significant impact. The coastal regions around Darwin were helped by the cyclone drawing up moisture from the ocean, receiving rainfalls up to 150mm. Tropical Cyclone Veronica developed quickly on Wednesday, the speed of its development due to the high ocean temperatures. The large system approached the Pilbara coast between Roebourne and Port Hedland as a category 3 on Sunday and in doing so slowed down. 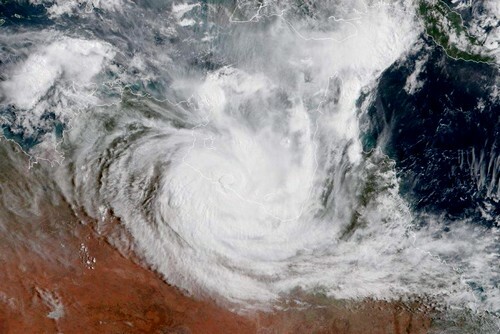 Cyclone Veronica, stalled off the Pilbara coast on Sunday morning. Technically Veronica never crossed the coast. Instead it almost stalled for 24 hours about 40km off the coast, before very slowly moving south west along the coast, always remaining offshore. As the atmospheric conditions became less favourable, Veronica weakened and was eventually downgraded to a tropical low on Tuesday morning. Even away from the centre (where winds reached up to 220 km/h) the winds were still very strong. Over 150 km/h were recorded on the Dampier Archipelago and at Roebourne. With Veronica just not moving along, the coastal regions had to endure those destructive winds for an unusually long time. Port Hedland was pummeled for 24 hours, and Roebourne for 30 hours! The same is true for the heavy rain which just kept falling. 24 hour rainfall totals over 200 mm were recorded at many sites, the record was 360 mm southeast of Port Hedland. The BOM photo shows the Shaw River crossing the Marble Bar Road, where the Marble Bar Road used to cross the Shaw River. The flooding affects the central and west Pilbara coast and especially Marble Bar. Major roads are under water, including parts of the Great Northern Highway (between Auski Roadhouse and Sandfire Roadhouse) and the North-West Coastal Highway (from Dewitt Road to the GNH). As in the NT, the winds brought down many trees and damaged buildings. The clean up efforts are expected to take a week at least. Ok, that was it in a nutshell. Two major cyclones, yet the Kimberley and the Darwin/Katherine region remained virtually unaffected. No wet season for us, to date it's been a damp season at best. As these two systems moved south, the monsoon trough above Australia broke down. However, some weather models indicate a weak trough may redevelop over the coming week. If it does, then tropical lows could develop once more. And if the trough moves over land again, widespread rain could still be heading our way. Yes, the Gibb River Road is already open all the way and grading is about to start. In fact, it has been open since March 15, but nothing along it is open yet. Most gorges and properties will not open until May. El Questro will open April 1, Emma Gorge on April 17. Digger's Rest opens on April 18. So for most of the Gibb, right now all you could do is drive through and look at the landscapes to the left and right. If you want to do that, please be aware that the road is still very rough with quite a few washouts, and also that the roadhouses are still on wet season hours. And that the first tourist already got bogged in the Barnett River. So check with the roadhouses if you need anything, and do check recent rainfalls as even isolated showers can make parts of roads and tracks boggy and can let creeks and rivers rise. The Fairfield Leopold Downs Road is closed between Tunnel Creek and Windjana Gorge, and the parks are still closed anyway. The Kalumburu Road has held up well over the wet. It should get inspected by the shire as we speak and if all goes well it should open Wednesday (March 27). Honeymoon Bay, McGowans Sunset Beach and the Mission Campground at Kalumburu are open for tourists. Drysdale Station will be selling diesel and unleaded once the road is open but other tourist services (camping, accommodation, meals) will not open until May 1. Mitchell Falls will not open before April 8. In April last year, in newsletter #65, I told you that Wongalala Falls at Kalumburu had been opened for tourists for the first time ever, on a trial basis. Newsletter #66 also mentioned that signs had been installed around Kalumburu, including the Wongalala turn off. I have good news: It appears that the tourists visiting Wongalala in 2018 heeded the requests to treat the place with respect. Everybody looked after it, nobody left any litter. As a result Augie Unghango, the main traditional owner for the area, agreed to open the falls again to tourists this year. Hooray. One thing has changed though: The sign at the turn off to Wongalala has been removed. The traditional owners want to avoid having hordes of tourists going out there (possibly even without a tourist permit yet, as the turn off is located before you reach the township). If you want to head out to Wongalala, the campsite managers at Kalumburu can tell you what you need to know about it (you also find that info in Destination Kimberley) and they will tell you how to get there and what state the track is in. Naturally, if they see people leaving rubbish around the camp or behaving disrespectful towards the place in any way, well, then they won't tell them. Easy. And here is a video by the first tourists who made it to Wongalala last year without a guide. This year's Gibb River Road Bike Challenge takes place from May 19 - 23. You may want to avoid the large number of bikes and support vehicles on the road and in the campgrounds, or you may want to get a chance to watch the spectacle. A new campgound is set to open at Baula-Wah community, or "Violet Valley". The community is located between Warmun and the turn off to the Bungles. It is 13km off the highway and the access track is only suitable for 4WD and offroad camper trailers. Violet Valley has 12 sites located along a ring road, all private and secluded in the bush. The campground will open some time in June/July. Once it does I think it will be a lovely option for people wanting to stop outside the Bungles but who aren't keen on a big, commercial caravan park. I will add more precise info, including how to get there, prices and contact details, to Destination Kimberley in the next days. "First and foremost, thank you very much for the two very informative books Destination Kimberley and Destination Top End. We have used them diligently in recent years. We are a couple of seniors who live in Switzerland and who have visited Australia for many years, usually 2-3 months per year. We are especially fond of the Kimberley and Gibb River Road. We have been through several times, and simply cannot get enough of the many beautiful gorges, as well as the landscape at all. 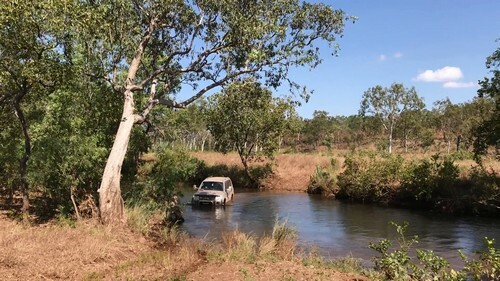 We can see, as you have also noticed in your newsletters, that the Gibb River Road is becoming increasingly commercial, but yet there is a lot of nature to explore. Previously, we have used rental cars, but after a very unfortunate episode in 2017 with Australian 4WD Hire, we decided last year to buy our own Bush Camper, a large 4WD with high clearance, snorkel and radios, roof top tent and all accessories. We have our base near Kununurra where our car stands when not used. Last year we were in Cape York, another great destination. Later same year through the Gibb to Michell Falls, for the first, but definitely not the last time. We followed your description to Cape Leveque and camped at Middle Lagoon. We have visited Lake Argyle and taken the sunset tour a couple of times, but find the sunset tour from the Zebra Rock Mine much less commercial and absolutely as beautiful. From Lake Argyle, with Lake Argyles Adventures you can visit Roy's Retreat, an amazing experience. For more information on Australian 4WD Hire see newsletter issue #73. The Zebra Rock Mine and Roy's Retreat are of course covered in Destination Kimberley. Well, and if you browse through the archived back issues from last season you will find many, many reader letters talking about the increase in tourist numbers and the resulting changes along the Gibb. "My wife and I and our 3 kids (aged 6, 9 and 11) did a 10 week journey from Melbourne up through Uluru to Kakadu, and then across to Broome on the Gibb River road last July to October, and your books were one of the highlights of our trip. We used your Red Centre and then Top End books, and then as we passed into WA we had a ceremonial move to your Kimberley book. Every day as we moved along our journey we would open up to the next page in your book and the whole family would listen as we read your words about our next destination, and then it felt like something was missing when we headed south from Broome through the Pilbara and West Coast and we didn't have you with us. Perhaps another book in the making for you?? Hopefully we can do the whole trip again with your guides in the coming years, we loved it." Thanks so much for the glowing feedback, Graham! Well, Graham is not the first to suggest I add another volume to the Destination Guide series. Many of my readers travel from Perth to Darwin or vice versa. It is not official yet, but the trip planning service that I always so warmly recommend is also trialling an expansion down the west coast. And I have been dreaming about adding such a guide to the Destination guide series for quite a few years. The thing is, there is a reason why the Red Centre guide was not written by me but by Monica Coleman. She knows that part of the world a lot better than I do! Writing a Destination guide requires intimate knowledge of a region, knowledge that can only be acquired by spending many years there. It can't be gathered on just a research trip or two. The Pilbara and west coast? I know next to nothing about it. So, I won't be writing such a guide. The question is, will SOMEONE write it? Do you happen to know of someone who may have such a guide in them? Someone who knows the Pilbara and/or west coast like the back of their hand AND who has the motivation and ability to get that knowledge down on paper (or rather, a screen)? If you do, please send them my way and let's talk. I am not holding my breath by the way, but hey, it never hurts to ask, right? Well over 120 people have already ordered the book 100 Things To See In The Kimberley, which I reviewed in the last newsletter. If you ordered, you should have already received your book or should receive it soon. Please let me know what you think about it! You should hear from me again soon, with more updates and info on what is happening with the weather and with everything else, as the Kimberley and Top End season slowly gets under way. (c) 2019, Birgit Bradtke. All rights reserved.